I certainly understand why Sound Pony is so heralded in the local scene and do think it's a local treasure/dive bar. I think there's quite a few places as easy or easier to hang out at including Inner Circle across the street. Fassler, Cellar Dweller and Open Container fit that type of scene pretty well too. I'm more of a fan of breweries which are top notch places to relax without any ticket and without as much noise or drunkeness (and more cleanliness!). For bars, I prefer places a bit nicer like Valkyrie, Mixco or Saturn Room but don't really go to bars anymore. I hope the town rallies behind Sound Pony to keep it alive and also Inner Circle. Cain's will be safe. That would be ludicrous for them to go after Cain's. Let's see if they can even get the condos sold at a price that makes this feasible first. 30% sold won't even pay for getting it up and roofed, much less any part finished. As a tenant, noise from 244 will be more persistent. I believe we are all speculating a good deal too much about Sound Pony going anywhere as a result of this construction. Isn’t 30% pre-sells the typical requirement to get financing? Given the struggles of Urban 8 and the price points of these units, if it were my money I would want commitments on closer to 50% before breaking ground. I am honestly mystified that people seem to shoot for that price point. I get that new construction is expensive, but the universal aim for Urban Luxury seems total counter intuitive to me. Regardless of what the requirement is, I'd be wary moving forward with just 30% sold after 4 years if I were the ones whose financials are tied to this, especially considering Urban 8 and the other 2-story condos for sell near the BOK Center. I'm not convinced Tulsa is much a of a condo town and Cherry Street seems to have that market cornered and has a better walkability rating. I'm wondering if the ability to sprawl so far out and availability of such cheap real estate all over has partially ruined the potential for urban condos (for some reason we just haven't had any while cities like Little Rock and flat lil Des Moines have far more!). Not to mention so many areas close to downtown are still ripe for development at such low prices. Then you have the extremely nice townhomes east of downtown available around $250-$500k. $600k+ is getting up there with condo pricing in some of the higher priced downtown condos in significantly larger cities. Yes, there's virtually no supply in the IDL, but that doesn't mean there will ever exist that much demand. This should be nick-named the Urban 32 as it is like the Urban 8 times 4. I hope it does well and sells fast and that I'm proven wrong in this, but seems like these developers are not learning anything from similarly priced Urban 8 (which are in a better, quieter, more-developed location and are extremely awesomely designed, huge mostly stand-alone units with amazing private balconies and garage parking). With all of that, they recently only sold for around $600k, after being on the market for 5+ years. They claim they did their "research" in other cities, but I can go to any city on zillow and find comparable downtown condos in terms of size and how nice for far lower price points. It looks like they should be aiming for ~$400k for the smaller 1,700 units, just to keep in line with the markets of KC or Dallas. I'll call it now that they won't sell most of the units in the next few years and they'll either have to reconfigure to get below $400k or it'll fail and they'll get stuck and need some sort of default/bankruptcy agreement to get some other company to finish it. I agree. It's maddening. They're aiming for the top 1% or so who are well covered with amazing housing options all around. Do they think those people will risk throwing away so much for such a risky investment/development? Every person buying in risks losing everything they put in if it doesn't get finished. But I guess some can be thankful the Urban 8 developer lost a lot of money to provide a few select lucky people with amazing living options right there. The same might happen here. I didn't have time to read the article earlier. Who are the developers and do they have prior development experience? The developer of Urban 8 had prior experience as a car dealer which might have something to do with the swing and miss on Urban 8. We can study other urban areas to death but Tulsa has always been a pretty unique place which seems to consistently contradict what works in other areas. Put this same tower in midtown and it would likely sell out at those price points. Something by Utica Square or over by existing condo towers around 21st & Riverside. Downtown especially in this location is just sort of an unproven market for high end mid-rise condos. I look at how this area has changed so much in the past decade and see a lot of potential upside though to being the first to develop something like this there. Same for Urban 8, they seem like a gamble now but probably won’t in 5 years. I agree Urban 8 will likely seem like a steal in 5 years and at $600k, they got a tremendous value even now, but the developer started selling them over 5 years ago at $875 and almost certainly lost a lot of money on that. It took 5 years, listing with multiple different realtors to sell 4-5 of them. A few are still owned by developers and the original developer. I just feel like if there was a market for $600k-$800k high end multi-unit condos downtown, more of those people might've come forward with more than 10 of 32 units sold by now. They barely just sold Urban 8s for that. That's going to be extremely expensive to find that out after it's built, but I do like the boldness of the plan. Shovels in ground will help sales tremendously. I think the $600K Urban 8 units were partially unfinished, so the move-in price was higher. In the past I assumed that the problem with selling downtown condos was the lack of customers willing to take a chance on buying when there are plenty of options to test the waters of urban living by renting. However, it seems the downtown residential scene is now mature enough that there should be a customer base for buying, yet the condo market is struggling, even as limited as the options are. Perhaps the majority of upper income empty nesters looking to downsize to a condo see Utica Place, Yorktown or 2300 Riverside as much safer investments. Perhaps the majority of upper income empty nesters looking to downsize to a condo see Utica Place, Yorktown or 2300 Riverside as much safer investments. That's where I would build my condo tower if I was in a position to do that. Existing options (comps) but all of those except Utica Place are outdated so new construction could likely fetch pretty high prices in that neighborhood. The problem would be finding the land for the right price (their cost basis is much lower on Main downtown) and neighborhood opposition to anything tall. 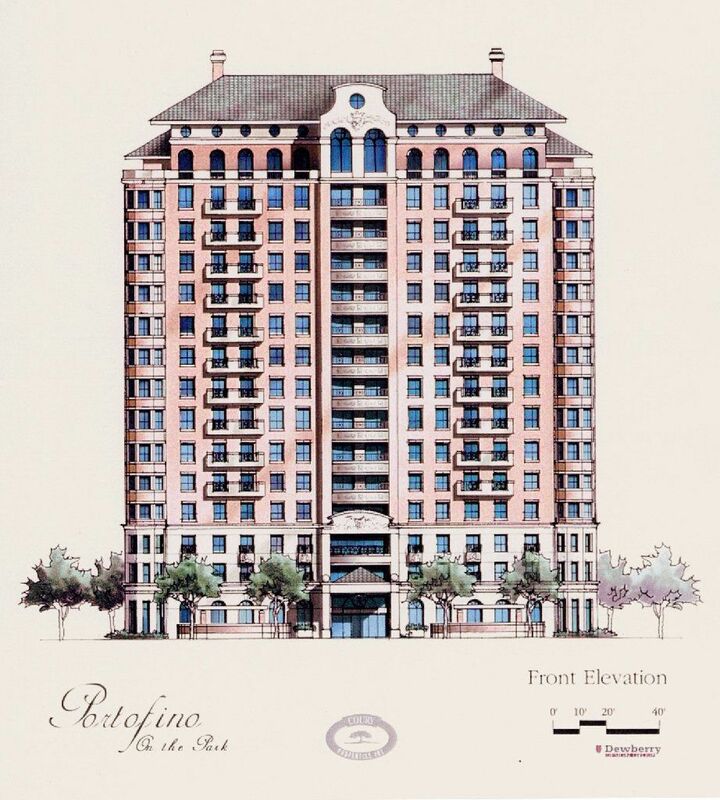 There was an uproar over the 20 story Portofino Tower proposed at 21st & Main in 2000, though I think the telecom bust/recession in 2001 actually killed that one. That’s funny, I drove by that still undeveloped lot this morning on my way to work and thought about the Portofino project and what might have been. I think it would’ve fit in there. Looks similar in some ways to Utica Place. Surprised it’s taken so long for Paul Coury to develop those empty lots. It didn't help for Urban 8. Or for 100 Boulder.